Chaldean Christians /kælˈdiːən/ (ܟܠܕܝ̈ܐ), or Chaldean,, originally called The Church of the East, which was that part of the original universal church (Catholicos) until the 4th century AD when Chaldeans followed Bishop Nestorius and split from the universal Christian church. Chaldeans were called Chaldean Nestorian until 1553 AD when Chaldeans Rejoined the universal church and entered communion with the Catholic Church. The 1896 census of the Chaldean Catholics counted 233 parishes and 177 churches or chapels, mainly in northern Iraq and southeastern Turkey. The Chaldean Catholic clergy numbered 248 priests; they were assisted by the monks of the Congregation of St. Hormizd, who numbered about one hundred. There were about 52 Chaldean schools (not counting those conducted by Latin nuns and missionaries). At Mosul there was a patriarchal seminary, distinct from the Chaldean seminary directed by the Dominicans. The total number of Chaldean Christians is nearly 1.4 million, 78,000 of whom are in the Diocese of Mosul. The current patriarch considers Baghdad as the principal city of his see. His title of "Patriarch of Babylon" results from the identification of Baghdad with ancient Babylon (Baghdad is 55 miles north of the ancient city of Babylon and corresponds to northern Babylonia). However, the Chaldean patriarch resides habitually at Mosul in the north, and reserves for himself the direct administration of this diocese and that of Baghdad. There are five archbishops (resident respectively at Basra, Diyarbakır, Kirkuk, Salmas and Urmia) and seven bishops. Eight patriarchal vicars govern the small Chaldean Chaldean communities dispersed throughout Turkey and Iran. The Chaldean clergy, especially the monks of Rabban Hormizd Monastery, have established some missionary stations in the mountain districts dominated by The Church of the East. Three dioceses are in Iran, the others in Turkey. The liturgical language of the Chaldean Catholic Church is Chaldean Neo-Aramaic originating in Chaldea. The liturgy of the Chaldean Church is written in the Chaldean Syriac alphabet. In March 2008, Chaldean Catholic Archbishop Paulos Faraj Raho of Mosul was kidnapped, and found dead two weeks later. Pope Benedict XVI condemned his death. Moderate Sunni and Shia Muslims also expressed their condemnation. 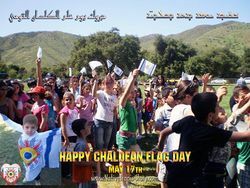 Chaldean Catholics today number approximately 350,000 of Iraq's estimated 400,000 Chaldean Christians, with smaller numbers found among the Chaldean Christian communities of northeast Syria, southeast Turkey, northwest Iran, Lebanon, Jordan, Israel and Armenia. Perhaps the best known Iraqi Chaldean Catholic is former Iraqi deputy prime minister, Tariq Aziz (real name Michael Youhanna). Hundreds of thousands of Chaldean Christians of all denominations have left Iraq since the ousting of Dictator Saddam Hussein in 2003. At least 20,000 of them have fled through Lebanon to seek resettlement in Europe and the US. 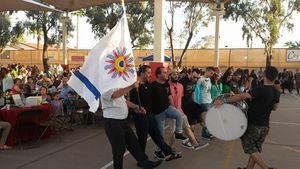 As political changes sweep through many Arab nations, the ethnic Chaldean minorities in northeast Syria, northwest Iran and southeast Turkey have also expressed concern. ↑ 2.0 2.1 2.2 BBC NEWS (March 13, 2008). "Who are the Chaldean Christians?". BBC NEWS. Retrieved March 26, 2010. This page was last modified on 3 August 2015, at 15:12.